Sewing a facing is a great way of finishing the raw edge of the neckline on a garment. 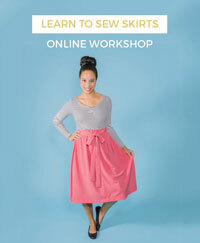 A slim-ish strip of fabric is cut to the same shape as the curve of the neckline, stitched, then rolled to the inside. 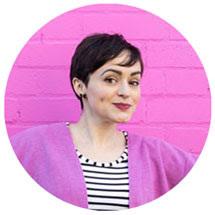 Take a peek inside some of the clothes in your wardrobe if you can't visualise it - it's very likely you'll find a few neckline facings. In this post I'll show you how to construct the neckline facing and attach it to the bodice, using the Mathilde blouse as an example. (Need to catch up? All the steps so far are outlined here.) This is a looooong post, but all the individual steps are pretty quick, I promise. Your neckline facing pieces - front and back - should be interfaced. Pin them together at the shoulder seams, right sides together, matching up the notches. Stitch. Trim the seam allowances. If your fabric looks like it's going to fray like crazy, you can finish the seam allowances with zigzag stitch or an overlocker (serger). Press them open on both wrong sides and right sides. The lower edge of the facing isn’t going to be stitched to anything, so it needs to be finished to make it look a bit nicer and to prevent your fabric fraying all over the place. You can finish this edge however you like - zigzag stitch, using an overlocker/serger if you have one, attaching binding… or if you’re really lazy you can just snip it with some pinking shears – you’re the only one who’s going to see it anyway… ;) Don’t worry about finishing the ends of the facing – they’re going to be hidden away under the back opening when we get to that bit. Now to pin the facing to the neckline. I find it helpful to add an extra notch at the centre front to help match them up - fold the bodice and facing in half lengthways, and snip a small notch at the neckline on the fold. Pin the facing to the neckline, right sides together. 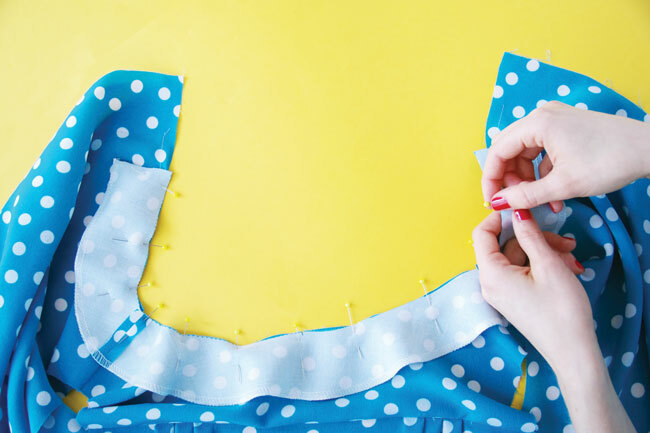 Start by matching up the shoulder seams and centre front, before pinning the rest. On the Mathilde blouse, the ends of the facing should stop 8.5cm (3 1/4in) from the raw edge of the back opening. Hopefully the neckline won't have stretched out if you staystitched it earlier - but if it does seem a bit big, you can ease the fabric in gently to fit the facing neckline. 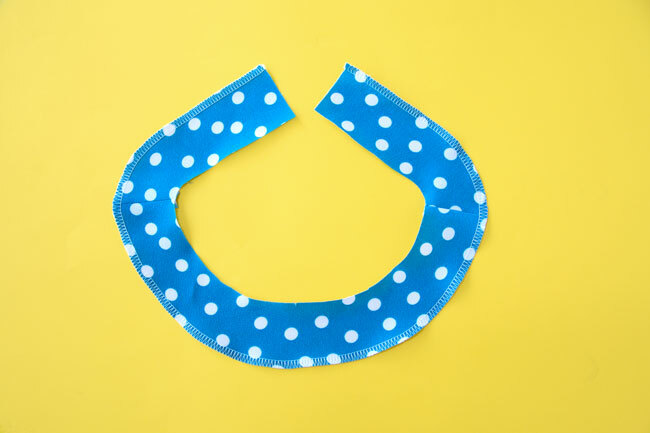 Once you’re happy that it all matches up, sew them together at the neckline with a nice smooth curve. 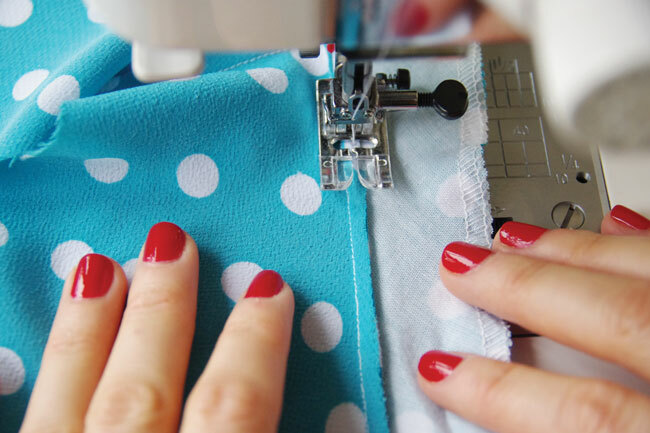 Sew with the interfacing face up on your machine - it will help stabilise the two layers so they're fed through at the same speed and don't ripple up. Smaller stitches can help navigate a curve, so you could change your stitch length to 1.5 – 2mm. Be careful that the shoulder seams don’t bunch up or fold the wrong way when you sew over them. Before turning the facing to the inside of the neckline, we need to reduce the circumference of the raw edge - at the moment it's longer than the curve of the seam, so the seam allowances would bunch up when turned to the inside. One way of reducing the circumference of the raw edge is to clip into the curve. Alternatively you can just trim the seam allowances down - this way is less messy. 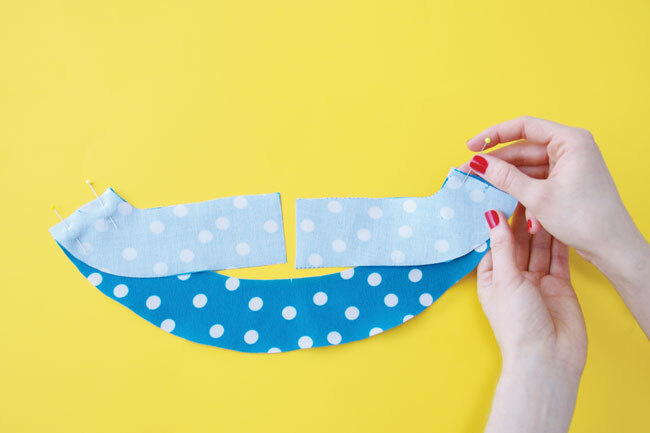 If you make one of the seam allowance layers slightly wider than the other, the edges won’t by lying directly on top of one another, so it’ll be less bulky. 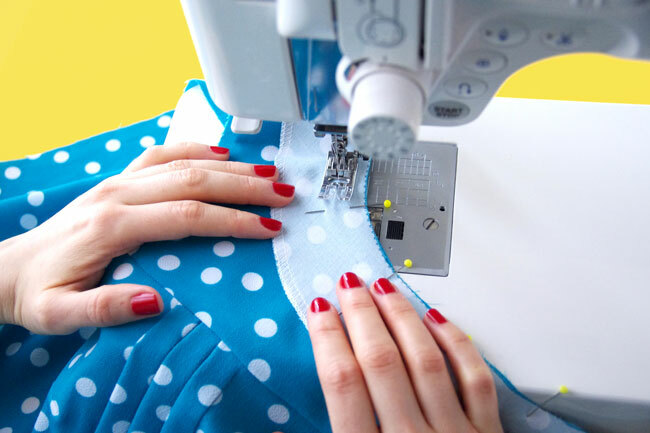 Press the seam allowances and the facing away from the bodice. Now you can understitch the seam allowances to the facing – this basically means stitching the seams and facing together, very close to the seam line. It will help keep the facing on the inside of the garment and keep the seam allowances lying flat. I'm showing you what it looks like to understitch from the wrong side of the fabric so you can see what's happening - but you may prefer to understitch from the right side. It's up to you. As you're understitching, gently pull the fabric away from each side of the seam line so you don't get any ridges. Now you can press the facing to the inside of the garment, rolling the seam line under slightly so it's not visible from the right side. 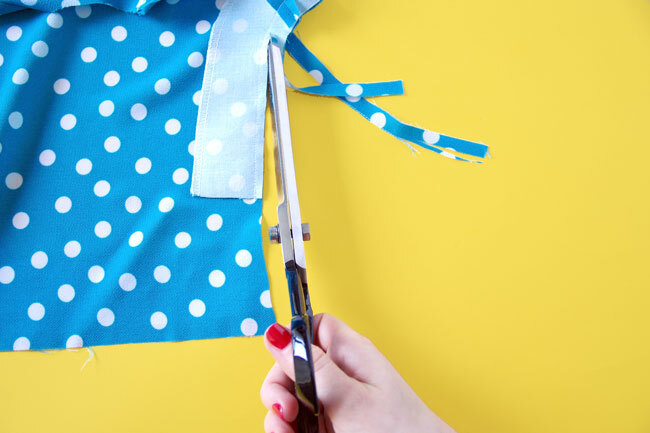 Use a bit of steam from your iron to soften the fabric first (without touching the iron to the fabric), then roll it with your fingers to and press in place. If you want to be extra certain that the facing isn’t going to roll to the outside, you could make a few little stitches at the shoulder seams – either by machine “in the ditch” (ie. hidden in the previous stitching lines) or catch stitches by hand. And that's how to sew a facing!